Robert Milkins revealed he is struggling with his vision after continuing his recent good run with a 6-0 thrashing of Michael Leslie in the UK Championship first round in York. The Gloucester potter, who lost to Shaun Murphy in the final of Ruhr Open on Sunday, made three 50-plus breaks. But the world number 16 said: "I've got something in my eye so my long game was a bit blurry. "I felt OK in the balls, but couldn't do anything with my long game." Milkins faces Leslie's fellow Scot Marcus Campbell in the second round on Saturday and hopes to have cured his eye problems by then. "I don't think I'll be going to the doctors," he added. "I don't tend to go to the doctors, just like any other bloke I suppose. "I'll see what I've got in the medicine cupboard at home and come back up. Hopefully it will be sorted by the weekend." And the 38-year-old is confident there is a still a great deal of room for improvement. 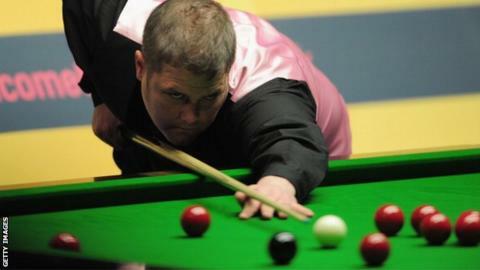 "I didn't play particularly well in Germany," Milkins said about his run to the final where he lost 4-0 to Murphy. "But I've been winning a lot of matches recently and when you're winning, everything just comes naturally. "I've got a lot of confidence after getting to the final. I was a bit annoyed that I didn't put up more of a performance against Shaun but he played really well and deserved his win."